The Boston Marathon has always been known for bringing out the best in people. It’s known for runners and participants in wheelchairs struggling against Heartbreak Hill and conquering it. 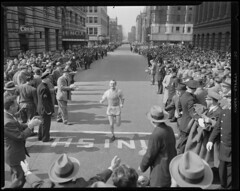 It’s known for Johnny Kelley, who competed in a record 61 Boston Marathons and ran his last full marathon at the age of 84. It always felt like such a small town event even though it was in the city. People spent the day cheering each other on. Strangers smiled at each other. It’s very sad that now it will be known for something else, something horrific. People around here say it will never be the same. Maybe that’s true, but I hope it’s not. I hope the spirit of the event and the people will rise above this. I hope strangers will continue to smile at each other.